I was sixteen when I started to read the Bible daily. I can remember visiting the Christian bookstore after summer camp and choosing The Quiet Time Companion from the shelves, a systematic reading guide with interpretive helps, questions, and applications. I was a new Christian and had been encouraged to read the Bible every day for the next six months in hopes that the habit would stick. And though I was committed to the task, I also felt as every new reader of the Bible feels: daunted by the immensity of this ancient book. I’ve been reading the Bible regularly now for more than twenty years. This isn’t to say that I haven’t missed days and weeks, sometimes even months, but it is to say that this book, more than any other, is responsible for forming me. In fact, it keeps delighting and surprising me—even confounding me (as I talk about it my next book, Surprised by Paradox). The Bible has become, as Jesus said it would, food on which I have come to daily depend. Which is why, as often as I have opportunity to say it, I try saying this: reading the Bible regularly is my most important spiritual habit. I don’t believe that we can know God, ourselves, or the nature of the kingdom coming without regular intake of this book. But what does the regular habit of intake look like? I’ve thought to share with you what it looks like for me to read the Bible and actually take it in. I don’t believe that my way is the best way or the only way, but it is a way. And sometimes you just need a way to get started, just as I did at 16 when I picked up The Quiet Time Companion at my local Christian bookstore. In his book, Hearing God, Dallas Willard wrote that “it is better in one year to have ten good verses transferred into the substance of our lives than to have every verse of the Bible pass before our eyes.” And that’s really the point of this post, to ask you about your habits, not just of reading the Bible, but allowing the words of God to be transferred into the substance of your life. Because Bible reading isn’t about accumulating arcane facts that will help you win at Bible trivia (although I do know the name of Moses’ mother). Rather, it’s a habit that forms us into the desires of God: we begin to love as he loves, even hate as he hates. Although I discovered Luther’s ideas long after I had been a regular reader of the Bible (I found this is Tim Keller’s excellent book, Prayer), I realized that I, too, tended to write down similar observations from my Bible reading: what I’m learning about the nature of God, what I’m discovering about my own sin, what I’m learning about the redemptive work of God through history, what I’m learning about my own calling. A quick glance through the pages of my journal reminds me of all the life we’ve lived in the last year and a half: I released a book, help coordinate major church initiatives, bought a house, started a house renovation, wrote a third book, continued raising five children. Halfway through the journal I switched to writing with the lovely fountain pen, given to me by a friend, the ink itself serving as reminder of God’s goodness. The journal is a written record of conversation: God talking to me, me talking back. It’s nothing extraordinarily deep because that’s not the point. The point is keeping company with God. 1. Find a plan. There are any numbers of ways of systematically reading the Bible. (You can find some here.) Get yourself a plan, and stick to it. It takes the thinking out of “What should I read?” And trust me, it’s the thinking that’s harder than the actual reading. 2. Find a partner. Tell someone that you’re starting a goal of regular Bible reading. The best thing is to enlist them to do it with you! The next best thing is to ask them to check in with you, to see how you’re doing. Accountability is key to meeting goals. 3. Find a purpose. Go to Scripture and expect God to speak. Then write down what you discover! a. What does he say about himself? b. What does he say about humanity? c. How does the passage illuminate the gospel? Jen Wilkin offers a number of excellent questions in her book, Women of the Word. 4. Find a prayer. Remember that God speaks to us, and faith is the act of response. Talk back to him! a. If God shows you his generosity, ask him to provide. b. If God shows you his faithfulness, ask him to help you trust. c. If God shows you his holiness, ask him to forgive. d. If God shows you his mission, ask him to commission and send! I was sixteen when a pastor at summer camp told those of us who had committed our lives to Christ to commit to some new spiritual habits, including reading the Bible 10 minutes every day. 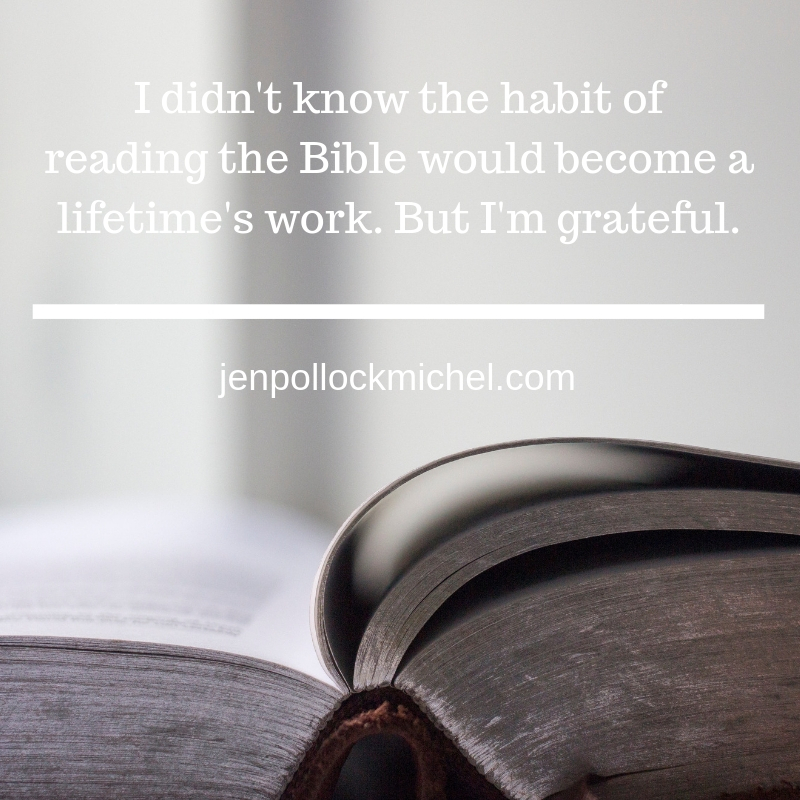 I didn’t know the habit would become a lifetime’s work—but I’m grateful. I wonder what God might have for you: if you started giving him 10 minutes of your day’s attention. If you’re interested in receiving regular content from me (a monthly blog post like this one and my monthly-ish newsletter), you can sign up here.